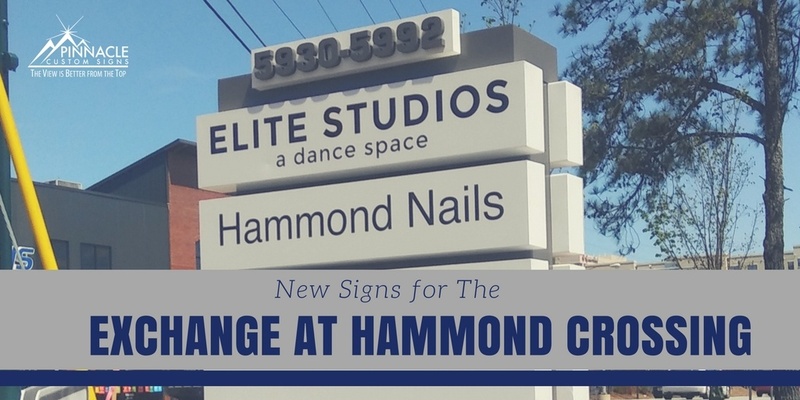 The owners for the Exchange at Hammond reached out to Pinnacle Custom Signs a few months back to discuss the need for new signage at their location. This business center in Sandy Springs had expanded their square footage and needed new exterior signage to both build awareness and assist with way-finding for those driving by the location. 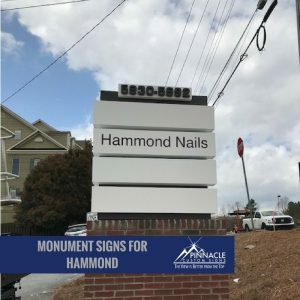 With the expansion of the businesses footprint, they needed additional building signage as well as monument signs for key traffic locations. To begin, we went through the scope of signs that the client wanted so that we could start the process of sign design, proof and approval. However, it wasn’t going to be that simple. In Sandy Springs — each of the signs also must receive clearance from the city. The ordinances for the city placed limitations on what the client could do with the signage design because the city does not allow back-lit or LED lighting. Sandy Springs requires that all permits for both ground and wall signs include dimensions of the signage, street address displayed horizontally, and note whether the sign has direct or indirect lighting. In addition, the sign’s material and color must be submitted for approval. Our design team had to work diligently to comply with both the look the owner’s wanted and the regulations that the city required. We pulled our design inspiration from the construction of the new building itself. Using similar colored materials for the brick base and the lighter stone panels with the same gray colored panel base, we were able to create a cohesive look and feel for these monuments. We actually used the paint swatches from the construction process to incorporate the same colors into the sign design. The owner wanted these signs to look like they were part of the construction and pulling from the architectural inspiration was the best way to accomplish this task. We also steered away from any back-lit or illuminated signs to stay within the city ordinances. The design included the addition of direct lighting at the ground level to help illuminate the signs after dark and make it easier for customers to find the business without violating city code. Next, we needed to help the property owners with creating directional signage that had a way-finding element. So, we once again pulled from the architectural elements of the construction and created mesh metal standing signs that used black panels to list the tenants. The mesh design played off the steel mesh look from the architectural design of the breeze way area for the shopping center. These unique tenant panels included laser cut arrows behind the mesh to point customers in the right direction for the new businesses and add a 3-D element to the design. Finally, we also assisted one of the new businesses – Elite Dance Studio- in making sure that their individual location was identifiable. 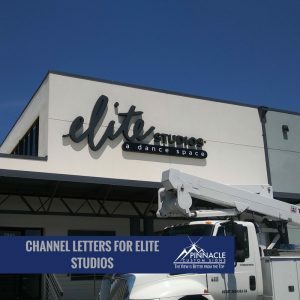 We installed channel letters for the front entrance of the building that involved several styles of font and display features to create a custom look for the business. 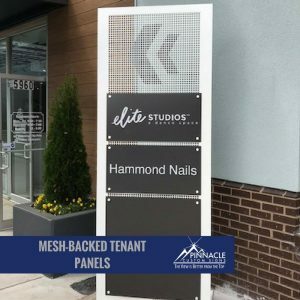 Elite Studios, along with Hammond Nails, also received branded tenant panels and custom signage on the metal breeze way structure to help guide customers in the right direction. We spent quite a bit of time on the design elements for this project to ensure that all parties were happy with the final product and to ensure that signs would meet the city ordinances. Our team has experience dealing local sign ordinances and codes across the country and is always able to assist you with your signage needs while staying within guidelines. We also have experience and can help you apply for a sign variance in unique situations where the existing sign ordinances may not be helpful for your business. It may not always work in your favor but having a team who has walked through the process before can be helpful when requesting the variance. If your business needs new signage for any reason, we are here to help you. Give us a call at (678) 714-8700 for a free consultation.